Ever wonder how the professionals get the streaky, but artsy look while painting walls? It’s a technique called dragging – and although the name makes it sound quite easy, there’s some special work that needs to be done to acheive a well painted “dragged” wall. 1. Walls in good painting condition! 2. A quick hand! Must paint fast. Now, to the fun stuff . . .
Once the walls are prepared for painting (primed, dried, and base coat applied – let dry again). You’ll mix the glaze with two parts waters to one part glaze for the perfect ratio. You’re going to moisten the paint pad with water before dipping it into the paint mixture – make sure you don’t put toooo much onto the pad as it can cause unblanced streaking. Start from top and apply the paint in one long, continuous vertical stroke. As soon as you finish your stroke with the paint pad, take a DRY paint brush and run it through the mixture, using only the smaller brush for hard to reach spots. Make sure you remove the paint from the paint brush after every stroke to keep it dry for the entire project. 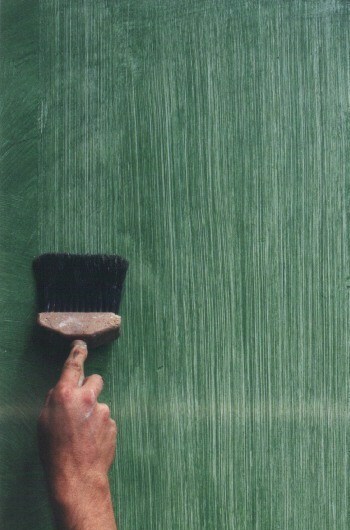 Apply the next paint pad stroke and repeat with the dry paint brush until the wall is finished. Overlapping the paint pad strokes will give the wall a continuous and professional look. For a crisscrossed look, use the same steps to apply the effect horizontally.